Ranveer Singh, Alia Bhat, Kalki Koechlin, Vijay Raaz and others. 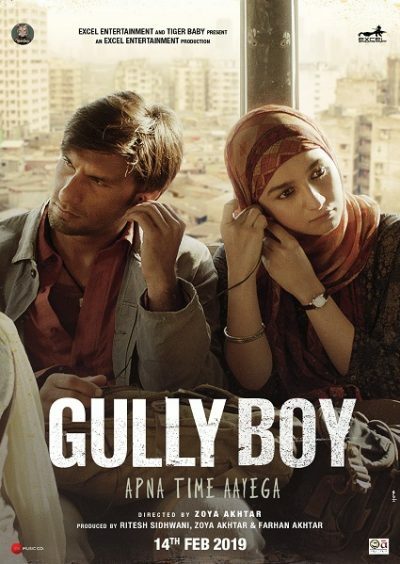 “Gully Boy” is a film about a 22-year-old boy “Murad” (Ranveer Singh) from a ghetto in Bombay. The son of a driver, his parents worked hard to get him educated so that he could have a white collar job. Meanwhile, Murad realizes his calling to be a rapper. Authentic Hip Hop in India is a recent phenomenon and like anywhere else in the world, is rising from the streets. Art is a distant dream for the colonized poor of India and this story is about Murad’s journey from realizing his love for rap and chasing his dream to inadvertently transcending his class. The film showcases street rap from the crevices of Mumbai’s by lanes. The poetry is conscious of the city's socio-economic fabric and highlights the challenges faced by the disenfranchised youth in the minority population.